Item # 299853 Stash Points: 2,799 (?) This is the number of points you get in The Zumiez Stash for purchasing this item. Stash points are redeemable for exclusive rewards only available to Zumiez Stash members. To redeem your points check out the rewards catalog on thestash.zumiez.com. 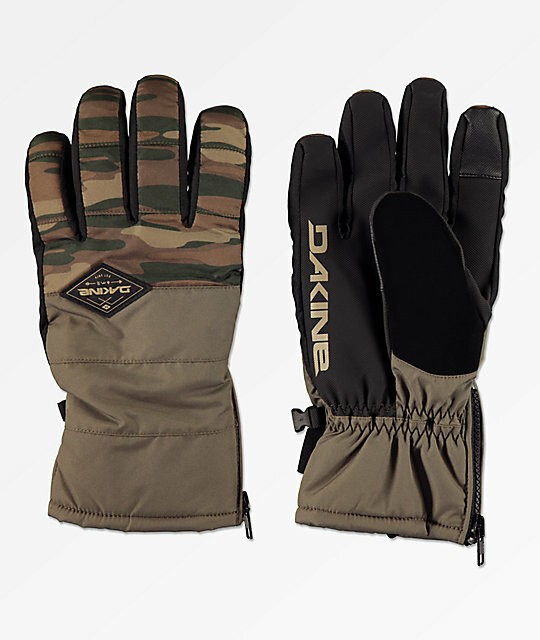 Keep your digits toasty and dry all season in the Omega Field Camo Snowboard Gloves from Dakine. The Omega Snowboard Gloves come with a 300g fleece lining that is sure to keep your fingers warm. This glove is touch screen compatible, so you can text and swipe on the lift without freezing your hands off. Dakine's DK Dry inserts trap heat while the DWR treated exterior is finished with a black and camo design. Omega Field Camo Snowboard Gloves from Dakine. Durable Water Repellent (DWR) finish acts as a moisture barrier on the nylon polyester shell. High Grip PU Palm: A durable synthetic, water-resistant palm material. High Loft Synthetic Insulation 110g: A low-profile, lightweight insulation that resists moisture in wet conditions while preventing heat from escaping. Dakine Warmth Index Rating: 3 out of 5. Dakine 18/19 Men's Method Series. 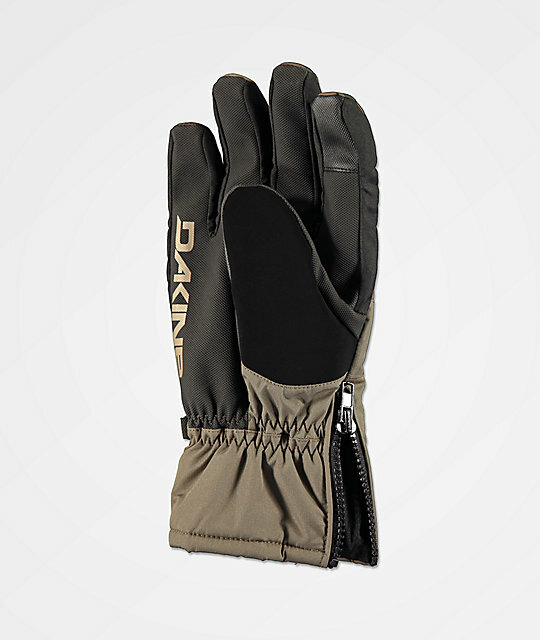 DK DRY™: Dakine's water-resistant inserts maximize value while minimizing water from entering for warmer, dryer hands. Liner: 300g fleece for superior dexterity and comfort with minimal bulk. Low profile zipper cuff closure.